Dimensional Analysis & Unit Conversions: Video 2. This video walks you through multiple dimensional analysis examples using easy MCAT Math to help you build confidence in the simple ‘given x ratio’ conversions trick. 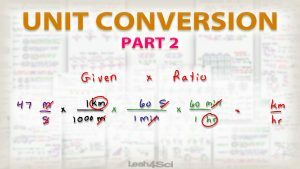 This is Video 2 in the Unit Conversions Series. Click HERE for the entire series.